Since its debut Halide has been one of the best manual camera apps available on iPhone. The month of September brought a number of challenges to Halide's team though, thanks to all the photography work Apple put into iOS 12 and the iPhone XS. And in response, within the span of a few weeks Halide has receive two major updates: version 1.9 on iOS 12's release date, and releasing today is version 1.10 featuring Smart RAW. Let's start with the latest update first. Last week Halide's designer Sebastiaan de With published an in-depth walkthrough of the radically-revised approach the iPhone XS takes to capturing photos. In short, the iPhone XS' photography prowess doesn't simply stem from an improved wide-angle lens, larger sensor, and other hardware changes – some of the most significant advancements have arrived through software and a new Smart HDR feature. As Apple noted in its announcement keynote, Smart HDR enables the iPhone to capture multiple images in quick succession at varying exposure levels then combine those into a single comprehensive image – all of this happens invisibly, without the user doing anything but hitting the capture button. While for most iPhone photographers, Smart HDR will be a major step forward that leads to improved images in most lighting situations, it poses some problems for those who prefer to shoot in RAW using an app like Halide. Because of camera changes designed to make Smart HDR possible, an iPhone XS RAW photo that eschews Smart HDR will often contain additional noise and be overexposed. To address this problem, Halide's team in version 1.10 is introducing a feature called Smart RAW. Designed specifically for the iPhone XS and XS Max, Smart RAW is a way Halide has been custom-tuned to capture the best photos with the new cameras. I'm no expert photographer, but I'm excited to see what kind of images the new feature makes possible. Smart RAW doesn't require turning on or off, it's simply the new way Halide takes photos on an iPhone XS and XS Max. As it gets in the hands of users starting today, I'll be interested to see comparisons between RAW photos taken on the new iPhones with Halide versus those taken using one of its competitors. For more information on Smart RAW, a full overview is being published by Halide later today, and until then you can read the preview published last week. Even if you don't own one of the latest iPhones, Halide's recent updates still bring plenty of noteworthy improvements. These include Siri shortcuts support for triggering the shutter by voice, a new Technical Readout mode to view detailed information about your device's cameras, a custom-made bokeh in depth photos, and more. The feature I've enjoyed playing with most is Halide's support for iOS 12's Portrait Effects Matte. From left to right: captured depth photo, Portrait Effects Matte, and traditional Portrait matte. 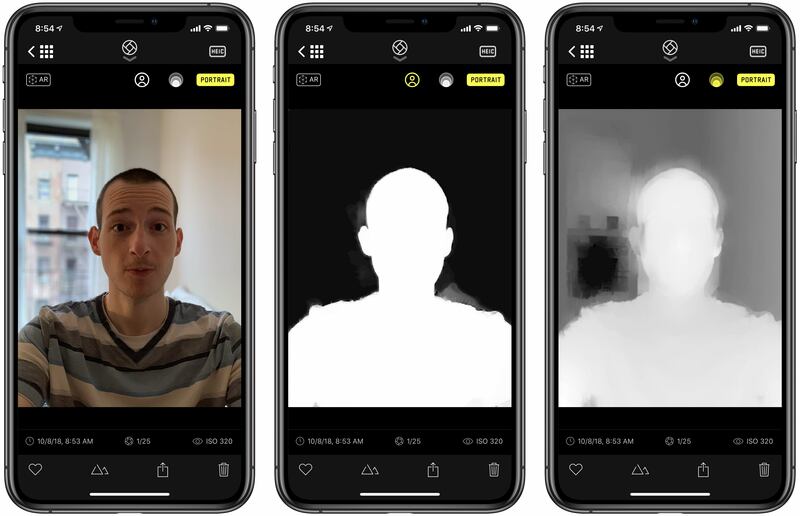 iOS 12 brought a big upgrade to depth photography in that it introduced the Portrait Effects Matte, a brand new way that iOS detects depth via the camera. In the past the iPhone has struggled with elements like hair and glasses when capturing depth photos, and the new matte does a much better job of detecting these details and creating an accurate border around human subjects. You can see the difference in the photo above, where the new matte captures the detail around each tiny piece of hair while the traditional matte is far more imprecise. Not every Portrait image captured on iOS 12 will include the new matte, but those including human subjects always attempt to, pending environment conditions. And unlike Apple's Photos app, Halide enables viewing the Portrait Effects Matte so you can see the exact subject border recognized by the iPhone's computational photography system. This can be accessed on compatible depth photos by tapping the human portrait icon near the top-center of the screen. There's still some uncertainty regarding in which situations, and on which devices, a Portrait Effect Matte is captured by the system Camera app. Sebastiaan de With notes on Twitter, however, that Halide uses it for images captured on the iPhone 8 Plus and X, in addition to the XS and XS Max. The iPhone 7 Plus unfortunately can't capture the new matte due to its lack of included neural engine in the phone. 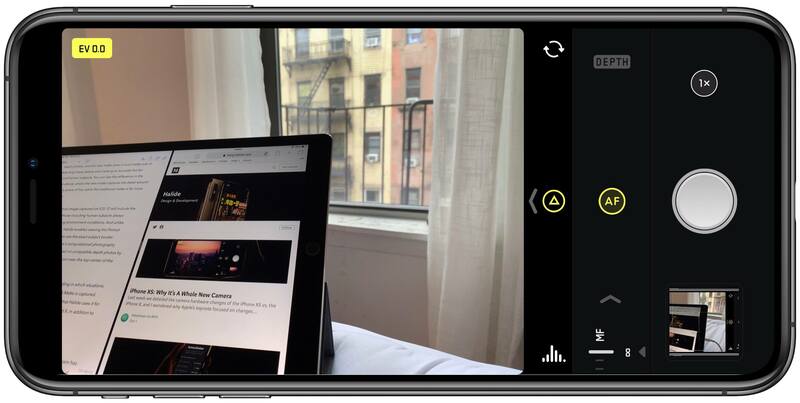 In a busy season for iPhone photography, Halide's team has been capitalizing by making its app the best showcase of everything the iPhone XS and iOS 12 have to offer. Today is merely day one for Halide's Smart RAW feature, but I'm hopeful that it will raise smartphone photography to a whole new level for seasoned RAW shooters. And with the variety of other changes to the app, it's an exciting season for Halide users whether you carry an iPhone XS or not. Halide is available on the App Store.